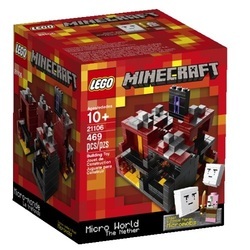 The Lego Minecraft set is one of the smallest designs made by Lego. Unlike its other models that have larger pieces, this set comes with tiny pieces designed for older children. With so much detail and resemblance to the virtual online game of Minecraft, Lego has taken this building set to a new level. Is your child a Minecraft fan? Is so, this Lego set is perfect for your child as he or she already knows what the modules should look like. Even if not, this is still a great set for children who enjoy Lego sets and/or enjoy building creative pieces, however they may prefer an alternative Lego set featuring a setting they can recognize. This Lego set was designed with an emphasis on creative play in the building of structures similar to the online virtual game. The theme for Minecraft is building craft tools to mine both gold and diamonds. The online game involves players creating their own structures and destroying others blocks with the assistance of an avatar. Instructions are included in this set for your child to use, or he or she can use their own imagination to create different structures. If your child follows the directions, he or she can build eight different modules. These structures take your child's creativity into consideration where he or she can even add tiny cave modules and a unique multi-layered effect. Lego holds up its reputation with providing high quality and detailed pieces for construction. The 408 pieces are very tiny, but full of detail resembling the Minecraft game. It also includes eight plates and a brick separator. The complexity of this Lego set is sure to keep your child engaged for hours. The one thing you need to be aware of is that the Lego pieces are very tiny. This means it needs to be kept away from young children due to a choking hazard. Your child also needs to be extra careful when playing with this set as the pieces can become easily lost. Overall, this Lego set is designed to impress. It's sure to keep your child, or even an adult collector, engaged for hours. You and your child will not be disappointed with the quality of Lego.